My long-awaited pair of DECWARE MG944 speakers arrived today, as promised. They look so much better in person than they do in any of the pictures or literature. The packaging was impressive; bulletproof, in fact. The speakers were so securely encased that they could have withstood being dropped from a great distance. This was my first glimpse of what was inside. How do they sound? Well, in this brief audition, they are just what I had expected. The deep bass is there; the speakers, even when new, convey a definite heightened sense of presence, over and above what my bookshelf models did. For example, listening to a piano recording I believe I can hear a certain punch that I did not notice before with the other speakers. I will be sure to post further impressions as I listen more. I was told that these speakers improve with more play and they open up as a result. Congratulations! You're going to have a fun month listening to music and then some day in that zone you'll hear an ease to the speaker that will really make you feel very happy to have invested the money! I've had three sets of Decware speakers and I honestly can't think of owning speakers by another maker. . . the Decware line really satisfies. I connected the CSP2 / TABOO combination to the MG944's and I think I like the Mini Torii better for the MG's. I really haven't spent a lot of time dialing in the pots on the CSP2 and playing with the lucid mode switch on the TABOO but the MINI TORII is unquestionably authoritative with these speakers. Even though I seem to be having this conversation with myself, I did dial in the CSP2 with the trim pots about halfway. The CSP2 volume control was nearly wide open and of course I used the direct inputs on the Taboo. This combination pushed the MG944's to where they opened up nearly as good as they had with the Mini Torii. Your not just talkin to yourself, many of us are with you on Decware speakers. Been following this thread with much anticipation. I have the second or third pair of these and I've taken the prototype retail radials out and put the MG944's back into the main rig. I must say that the MG's never fail to please. They are more relaxed than the particular radials I have but l have to say the detail is all there. Not only will a great SET amp do wonderfully with these but add more power and you can drive the snot out of these and they just sound unstrained and powerful. Four 5" paper cone drivers have no business filling a room with this much full bodied and balanced (not boomy) and deep bass. Riviera... are these MG's not simply transparent and unboxy sounding? Very little territory remains uncovered by this well rounded speaker. The simplicity of its design is IMHO part of the reason this speaker does what it does. so well. I encourage anyone to hear all the Decware speaker offerings but I am a shameless fan of this particular speaker in that it is a dollar value unmatched by any speaker I've ever known. Didi I mention it looks sharp too! I would have hoped for more reviews than mine on the review portion of the Decware site. BTW Riv glad you are getting the amps dialed in nicely. I love it when "synergy" is achieved. FWIW don't ignore the room treatments or which particular room you have the speaks in. I suggest everybody have a little party day and set up your speakers in several different spaces in your home and see just how different (for good or for bad) that changes the sound. Gee Riv, where'd ya go? I've been enjoying my MG's this past couple weeks more than ever! Particularly the last couple days. Let us know how they're playing for you. The MG944's are doing very well with the CSP2 - Taboo combination while the Mini Torii is away for a minor repair. The MG speakers are extremely well balanced, not too bright; the bass is very well controlled. Schweikert VR-1 monitors are a very nice speaker, however. I have owned them since May, 2007. 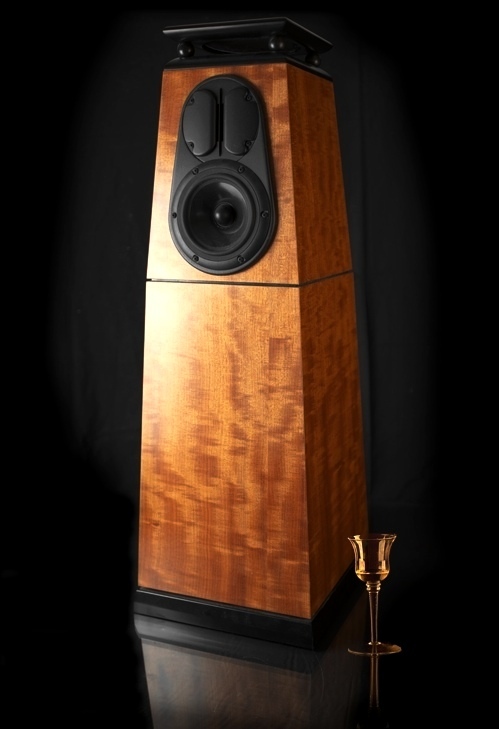 While they, too, are very well balanced, they are only a bookshelf speaker. Therefore, certain compromises are present. There were times where the Vons were overcome when pushed very hard. However the bass these little monitors put out is truly remarkable. The DECWARE equipment seemed to open these up very nicely. Before buying the MG's I thought of some Klipsch floorstanders, probably RF-82 or RF-63. Thinking how the horns in those RB-5's bounced the high frequencies all over this little room - something held me back. I also believe that the price point for the MG944's is closer to the Klipsch RF-82, but that the MG944 was a much better buy. The real wood veneer alone on the MG's outclasses the wood like vinyl on the RF-82's. The MG944's are easy to listen to, at any volume. The bass response is terrific. The midrange is nice and the top end is easy but at the same time not rolled off. They are not finicky regarding placement. They are extremely well balanced with no particular emphasis on either the top or bottom end. I could not be happier with them. I only regret not ordering them sooner. Frankly, these are the improved version without that silly scalloped front that the original had. Steve's willingness to take a second look at his designs shows that he is sincere in wanting to keep improving on what works. Riv, I have the ones with the "silly scalloped" front. i imagine the bass is more consistent with the plinth base yours have. I only have carpeted floors so there is not much change for me in different rooms. I rather like the original design and also like the plinth bottom as well. After 500 hours of play you will see (hear) something from these that is simply stated as "smooth", meaning that the balance your hearing now becomes seamless from bass, to mids into the highs. Also the deepest bass is produced at lower volumes than your getting now before extensive break in. I'm glad you found the woodworking to be so wonderful. I'm always amazed at Bob's products, you can tell that nothing goes out the door unless it's exactly right, and though it's the sound that we get the speakers for, and they deliver, it is also definitely a joy to have these beautiful pieces on display every day. I've loved the looks of all my Decware speakers, and my current IT Radials are the most beautiful speakers I've every had. Everyone who sees them remarks enthusiastically. I've never heard the MG944s so I appreciate yours and Crhis' "run down." Anyone driving these with a Zen Select? I would like to know your impressions. I was listening to the MG's last night with the Mini Torii and was amazed at how they handled some complex music. It was a Duke Pearson CD with some choral passages that were reproduced a lot more lifelike than the presentation my former bookshelves were capable of. Oh I have that Duke Pearson cd. . . love it! The set has 4 discs in it, not 3 like the others. The last disc has material from a Christmas album, very complex, layered sound. Well, I don't know which set that would be. I have the three cd set, which has the Xmas album, and I have all the discs in that set except the Xmas album (which was not on cd before) on separate discs. I really like the "How Insensitive" album. Don't you still have a select? If so, how does it work with the MG's? No, your not having this conversation with yourself, I love reading other peoples impressions of the Decware speakers, and amps for that matter. Only 1% of the people that buy the gear whether it be amps or speakers post anything about there impressions on the forum. Good or bad!!!! I don't always have MG's to listen to, sometimes getting a pair done on a Friday so I can enjoy them over the weekend before I have to ship them off. The Mosaic Duke Pearson #8 that I have has a 2-disc jewel box for No. 1, and in addition to the Mosaic #1 disc, a Blue Note disc with the Duke Pearson "Sweet Honey Bee" album on it. Okay. That's not how the set comes from Mosaic! If you bought it used, someone created that in their own collection I guess. Sweet Honey Bee is a great album! Duke Pearson is sadly overlooked and undervalued as an artist these days. Nope, no select Bob! Had the gray Zen"C" but sold it several years ago. Tell you what I'll do...I'll take to running the MG's on a single stereo pair of EL34s with my Integrated (about 3 wpc) and report back to yuns. That is as close to a Select as I have power wise. I've used a single Zen C with the MG's for some time. But when I added a second Zen C there was an obvious, instant improvement.